I wish we could design our own outfits like the mpcs of clubpenguin anyway she looks like agent dot from Epf ,though she has a better outfit and hair style. do you think she is dot or a different person? The Great Snow Maze and Toboggan and Sports Catolog Cheats! Club Penguin has released their newest party for members only at the Ski Village! It’s called the Great Snow maze! There’s tons of fun throughout Club Penguin for all players though. Now you’re ready to start the Great Snow Maze. If you want to cheat, Club Penguin has posted a map for you to use at the Ski Village. To view the map, first click on the Maze Map stand. Then click on the big red button in the bottom right that says “Show Map.” Finally, a map will appear with the directions to go in the Great Snow Maze. You will enter the maze. There are many different directions to go, and there are a few ways to reach the finish point, just remember at the end to cross over into the center path. Once you make it to the end of the maze, you see Yeti Cave. After months of having the Soccer Pitch, the Ice Rink has finally returned to the Club Penguin map. It has replaced the Soccer Pitch. You can find the Ice Rink next to the Snow Forts. Which do you like more, the Ice Rink or the Soccer Pitch? 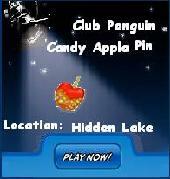 Here are the new hidden item Club Penguin cheats in the new November 2009 Snow and Sports Shop catalog. 1. Go to the 1st page of the Snow and Sports catalog. 2. Click on the green penguin outside of the Ice Rink. 1. Go to the 2nd page of the Snow and Sports catalog. 2. Click on the light green penguin in the top right. 1. Go to the 3rd page of the Snow and Sports catalog. 2. Click on the letters, “ICE” in the top left. Club Penguin has added a legend and instructions guide for Card-Jitsu fire at the Fire Dojo. Hopefully these sleds actually make you go faster in sled racing unlike the other ones. But they look real cool. I had a tobbogan once and every time i went down a hill i kept spinning around and my dad rode it too and he tumbled all the way down. I will be busy for the rest of the day you know black friday I think Galileowill be too. Okay before we begin let me tell you are able to play up to 4 penguin in a game! Cool Right? Okay Now lets start…. Okay to play this new game all you need its cards. It’s pretty easy just choose a rock and a number will appear, once you choose a rock you will need to choose one of the 2 elements shown. When you choose the elements you will need to play with those element cards. Easy right? A lot of construction has been going on at the Dojo Courtyard, Ninja Hideout, and the Fire Dojo! Check it out. The Fire Dojo looks the coolest so far! It looks like the Card-Jitsu Fire mats are getting set up for November 24th when we’ll be able to play! Wow, I can’t wait until November 24th! Here are all of the Club Penguin Cheats for it. Click on the speaker on the Ticket Booth. Click on the top left part of the Window. Click on the two knobs on the Electric Stove. Those are all of the new Club Penguin November/December Better Igloos Catalog Cheats! What do you think of the new furniture? Here are the Club Penguin Cheats on finding the new Hot Chocolate pin. 1. Click on your map and go to the Town. 2. Go inside the Coffee Shop. 3. Click on the Hot Chocolate pin. You have now found the new Club Penguin pin cheat! Snow Maze Craze and Card Jitsu Fire, Water, and Ice!? Somewhat of a maze…I love mazes!!! Can you master it? Cool Huh? The new room is not done yet but we can enter and see how will it look like! So far is looking great! Anyways, I think this new room will be available November 17th. I think it would be super cool to be able to earn coins while playing Card Jitsu. That said, I don’t think that Sensei would approve of his game being changed into a coin-making venture. Who knows if it will be possible at some point in the future though!? As far as the new Card-Jitsu Fire game goes, I am sure that being overloaded with penguins wanting to play will have been thought of by the event planners and construction workers. I am sure that once the game is released that it will work just fine. You know, the Dojo is indeed surrounded by Fire, Ice and Water. I wonder if there will be other element games at some point in the future. I guess only time will tell! If you ever have any other questions please write back and let us know and we will do our best to help you out. so there might be two more elemental games…to bad no coins hahaha!!! Winter items are here! This new catalog its pretty sweet but now its time to start looking for the new hidden items! Go to the Second Page of the Catalog. Go to the Fifth Page of the Catalog. Go to the Third Page of the Catalog. We know it’s been a long time since you’ve had a new Mission and we’ve heard from a lot of you that you want one! We haven’t forgotten about you guys – and we really want to say thanks for being so patient. PSA – Some of you are wondering what’s keeping Herbert P. Bear occupied these days and what he’s got in store for the Penguin Secret Agency. I don’t want to give much away right now, but we do want you to know that the team’s working on something big. For now, keep up the things you’re doing to keep the island safe, and I’ll keep you in the loop when I’ve got more info. Now if you go to Hq the television that is broken is the town one (i think so that gives us something to go at. Anyway I guess thats it comment if i miss something i will mention your name too.